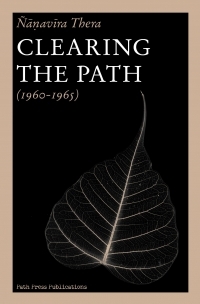 Before use is made of Seeking the Path – Early Writings of Ñāṇavīra Thera (1954-1960), the reader should be familiar with Clearing the Path – Writings of Ñāṇavīra Thera (1960-1965), to which the present volume serves as a supplement. The major portion of Seeking the Path consists of letters written to Ñaṇamoli Thera. With the manuscript letters, which were preserved by the recipient were found draft copies of some of the replies which were sent to Ñāṇavīra Thera. These have been included here; it should be remembered, however, that they are only draft copies and not final versions. 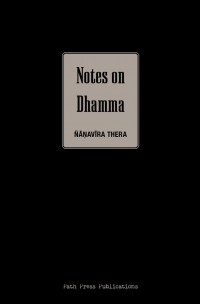 Following the letters to Ñaṇamoli are a few letters written to Ñāṇavīra Thera’s chief supporters: Mr. and Mrs. Hinton Perera. The two essays following the letters were published (the Sketch was reprinted several times) in abbreviated form: the texts reproduced here are taken from the author’s typescripts, which may be regarded as the definitive versions. 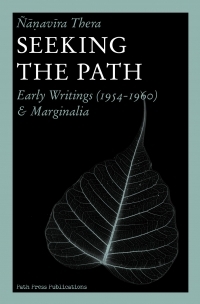 Following these two essays are the contents of the author’s Commonplace Book, and then Marginalia, being the comments the author made in the margins of various book which engaged him (together with the text commented upon, where useful). Finally there is a collection of various papers discovered after author’s death: notes, translations, etc. 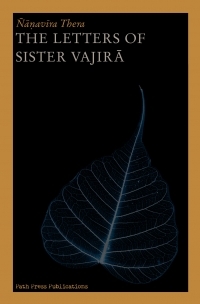 These have been edited only to avoid unnecessary repetition of material already contained in other parts of this work.